ORLANDO, Florida, October 13, 2011 (ENS) – The largest transportation technology association in the United States, the Intelligent Transportation Society of America has selected 25 live demonstrations that will bring the future of transportation to life at the 18th World Congress on Intelligent Transport Systems. The event is taking place in Orlando from October 16 through 20. Held once every three years in the United States, this international exhibition will feature cutting-edge transportation solutions and is expected to draw some 8,000 delegates from more than 65 countries. U.S. Department of Transportation and a range of private sector companies will display the realm of possibilities for connected vehicles and other technologies that will lower driving costs, reduce traffic congestion, improve travel safety and reduce emissions. These next-generation solutions are examples of a growing industry that is helping to improve U.S. infrastructure while promoting economic recovery and development. “We’re extremely excited to see some of these concepts in action,” said Scott Belcher, president and CEO of ITS America. “From cars that brake when they detect pedestrians to digital road signage on the dashboard to vehicle systems that help save gas money and the environment, these demonstrations will show it all,” said Belcher. “This is the one time that people will have an opportunity to see and experience all of these innovative solutions in a single location before they are put into production,” he said. For instance, DENSO International America and the Econolite Group Inc. will demonstrate how connected vehicle technology could move vehicles safely and efficiently through a network of signalized intersections. The connected vehicle sensors on traffic poles detect changes in traffic conditions, such as increased car volumes approaching an intersection that will extend the green light for better travel times. Drivers with connected vehicles will receive notifications from the signals and can be given optimal speeds for making green lights, allowing drivers to catch what the companies are calling the “Green Wave,” reducing starts and stops. All 25 demonstrations will be a part of the 18th World Congress Interactive Technology Showcase that attendees will be able to experience at the Orange County Convention Center and in the local community. The Technology Showcase this year has been organized into themed villages that each highlight a specific use or application for areas – Safety, Mobility, Environment/Sustainability and Pricing. The Safety Village will focus on technologies designed to prevent or reduce accidents and improve overall traffic safety that include lane-keeping technologies and collision avoidance systems. The Mobility Village will display solutions for cities and states that reduce congestion and keep people and goods moving through integrated network and system improvements that will ease travel times. The Environment/Sustainability Village will demonstrate automated traffic management and incident management systems that have proven to cut traffic congestion pollution caused by roadway incidents. The Pricing Village will exhibit technologies designed to make travel more predictable, reliable and less congested through innovations such as universal electronic tolling and demand based congestion pricing. Many of the demonstrations in the Technology Showcase will be focused around the Connected Vehicle Technology Test Bed for Connected Vehicles, people and infrastructure. Connected Vehicle technologies allow cars to avoid crashes by communicating with each other and the roadway infrastructure. Using GPS, WiFi sensors and a special Federal Communications Commission approved short-range radio frequency, these vehicles share safety information in real time and drivers receive safety warnings when there is a risk of a crash or other safety hazard. The U.S. DOT estimates that these technologies have the potential to reduce accident fatalities by 81 percent in all unimpaired driver-related crashes. 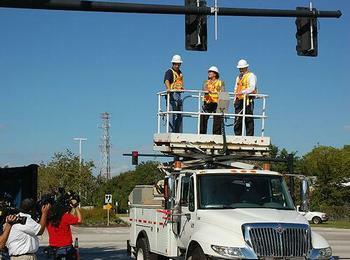 This Connected Vehicle Test Bed infrastructure will remain in Orlando after the World Congress. As an early adopter of new intelligent transportation and Connected Vehicle technologies, the Florida Department of Transportation will be ahead of the curve as these technologies are rolled out nationwide. Telvent Chairman and CEO Ignacio Gonzalez and Patrick McGowan, president of Telvent Transportation North America, will give the keynote address on “Enabling and Delivering the Smart City Moving into the Future” during the opening ceremony of the Congress on Sunday. McGowan is also the chairman of the Congress. With North American headquarters in Houston, Texas, Telvent is a smart grid resource for basic city infrastructure projects in the transportation and energy industries. To support the transportation industry, Telvent offers SmartMobility, an integrated suite of solutions. Other speakers at the World Congress will include U.S. Transportation Secretary Ray LaHood, Florida Governor Rick Scott, House Transportation and Infrastructure Committee Chairman John Mica, Ford Motor Company Executive Chairman Bill Ford and General Motors Vice President of Global R&D Alan Taub. More than 20 transport ministers and senior officials from around the world will participate in a Roundtable discussion of how infrastructure and transportation innovation impacts the global economy. The World Congress will offer more than 300 sessions and provide attendees with session tracks focused on topics such as Traffic Congestion and Management, Highway and Vehicle Safety, Next Generation Traveler Information and Consumer Applications, Performance Measurement, Sustainability, Mobility and Operations.